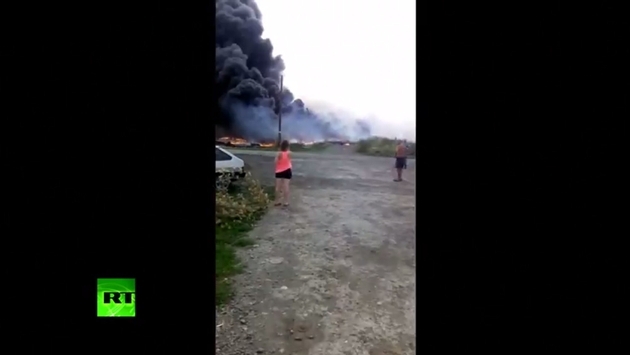 New amateur video has emerged of the purported immediate aftermath of the crash of Malaysia Airlines Flight 17, which was shot down in July presumably by pro-Russian separatists in an area of civil unrest in eastern Ukraine. The video, posted on YouTube by the Russian newspaper Komsomolskaya Pravda, shows the chaotic, frantic and sad moments after the flight crashed in a field near a small town. While some residents rush to the wreckage and try to put out small fires with equally small buckets of water, others are shellshocked and just stand around. It was the second tragedy of the year for Malaysia Airlines. In March, Flight MH370 completely disappeared en route from Kuala Lumpur to Beijing. The flight appeared to veer well off course; not a single piece of wreckage has been found in the eight months since. Solving that mystery has been fruitless; solving this mystery of MH17 has been dangerous, given the hostility in the area. Rescue workers and others have been hampered by military forces who took control of the crash site almost immediately. Finally, the removal of the wreckage began Sunday, according to the Dutch Safety Board said. Nearly two-thirds of the 298 passengers on board were from the Netherlands, where MH17 originated en route to Kuala Lumpur.